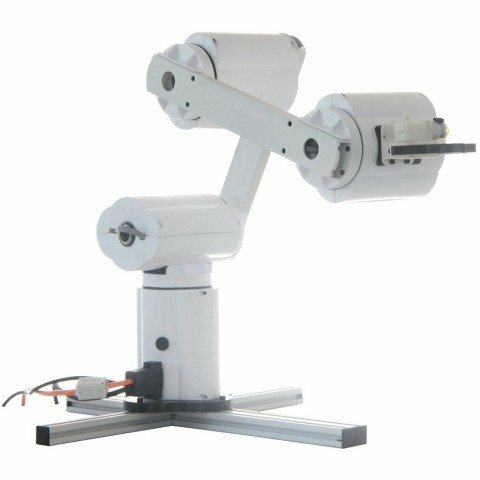 The Robot Arm Mover4 Starter Set is a robot arm that has been designed especially to meet the needs of schools, universities and R&D institutions. The starter set contains everything to dive into robotics. The Mover4 robot arm allows replaying automation scenarios close to reality and can be used as a motion platform to connect physics, math and computer science with reality. With its four axes it can move free in space and turn it's hand. Different tools can be attached to the flange, e.g. a two finger gripper or an electromagnet. With the gripper the robot has a reach of 550 mm and a payload of 500 g. The Starter set comes with the two finger gripper.